Prof. Desai tried to explain how finance is related to Humanity. His book “The Wisdom of Finance: Discovering Humanity in the World of Risk and Return” tries to connect two worlds which one thinks are not connected. He started by a quote from Wallace Stern “Money is kind of Poetry” and followed it with a number of Pictures from history, each trying to communicate something important in contemporary world. Most of the activities or events in the real world do not need complex formulae or algorithms to deal with them successfully. Take the example of Fly ball or cricket ball. In order to catch the ball, one can build in complex equations taking into consideration the angle of trajectory from the ground, force it has been hit with the bat, acceleration and later deceleration, and finally the spot where it will land. If the player were to do all those calculations in fraction of seconds will he be successful? Nope. Instead he is trained to run behind the ball keeping the angle of gaze constant, until the ball lands up in his hands. Take another example of using simple heuristics. Chesley Burnet Sullenberger III (Sully) is a well known airline captain who landed US Airways Flight 1549 on the Hudson River off Manhattan after both the engines shut off as the plane was being hit by a flock of Canadian Geese shortly after take-off. All the 155 passengers on board survived. After the trials, the National Transportation Safety Board ruled that Sully made a correct decision in landing the plane on the river instead of attempting to return back to LaGuardia airport. Simulations performed at the Airbus Training Center Europe in Toulouse showed that the flight could have made it back to the airport had that maneuver begun immediately after the bird strike. However, such scenarios both neglected the time necessary for the pilots to understand and assess the situation, and risked the possibility of a crash within a densely populated area. In both the above examples the intuitions of experts and the simple rules they followed helped them take faster and better decision. Such simple rules or heuristics are often been overlooked by the people. There are three widespread misconceptions about them viz. heuristics are always second-best to optimization based decision models, heuristics are unconscious and error prone, and complex problems require complex solutions. That happens because of failure to distinguish between “risk” and “uncertainty” and responses to deal with them. Professor Gerd Gigerenzer provided valuable insights in this area in a simple and humorous way. The four key messages from Gerd were (1) “risk” is not “uncertainty”. This distinction is still not very well understood & appreciated by many academicians. When we talk about risks, perfect knowledge of the future states of the world, their consequences and probabilities are available. Whereas under uncertainty all the future states, consequences and probabilities cannot be foreseen. Hence the best decision under “risk” may not be the best decision under “uncertainty”. (2) For taking rational decision making under uncertainty, simple heuristics are helpful as they reduce error compared to complex models which over-fit the past data. To illustrate the same consider the last year’s data on London’s daily temperatures or levels of any financial market index. Professor showed curves fitting the past data drawn with polynomial equations having degrees ranging from 1 to 12 degrees. Which one of these fits this data better? Naturally, the one with more degrees. However, when it came to predicting future temperatures or levels that was not true. The one with 3 (and up to 7) degrees predicted better than the higher degree polynomials. Likewise the one with only one degree showed higher variance. Hence the phrase from Einstein “make it simple but not too simple”. One degree has high bias + moderate variance. Third degree polynomial too has high bias but low variance. Higher degree polynomials like 12 degrees lead to low bias but very high variance in predictions. So in the field of predictions under uncertainty, you need to scale things down. (3) Are Finance Theories useful? We need new financial models, which are simple and have better predictability. Optimization models used to manage risk only create illusions of safety. (4) Lastly, less is more. Simple heuristics decision model can be more effective than complex optimization models. For example, the Fast & Frugal Tree for assessing bank vulnerability and comprising of only few key variables like (a) leverage ratio (<4.1%? ), (b) market-based capital ratio (<16.8%), (c) Loan to deposit ratio (> 1.4%) is more likely to succeed. This is because (i) they are simple to explain to key stakeholders like management and investors and easier to monitor, (ii) the correct combination of indicators can be less prone to gaming by the industry and (iii) banks can be spared with all complex stress tests. Hence simple effective rules are better. Speaker: Matt Gertken, Vice President, Geopolitical Strategy, BCA Research Inc.
Matt Gertken spoke in details about geopolitical situation globally. He delved in to history, explaining how move to the right in 1990’s created inequality and the resultant backlash in UK & USA. Then, he went to explain the poll arithmetic and how pundits generally get it wrong but the polls aren’t that bad. He also explained, why politicians react the way they do, as they are driven by constraints and not by preferences. According to him, a recession makes it significantly challenging for an incumbent president to win back the mandate. In fact, structural reform may lead to set back for ruling dispensation but will be beneficial for the economy in long run. On the future outlook, the key take away were: Fed is expected to hike interest rates, there will be patches of corrections stock Market, don’t expect trade wars to be resolved any time soon, Oil prices will rise and China may try to stimulate economy without success, developing markets will continue to perform better & due to rising trade dispute, consumer oriented economy like India are expected to outperform. Also, India is slowly de-leveraging which is a positive sign. The cleaning up of banks, formalization of taxation and markets is credit positive for India. On the US China trade war, though, the recent correction in US markets would have prompted Trump to soften position on trade dispute but the US is more insular economy, thus less depended on trade. In contrast, China is slowly becoming insular but is still vulnerable. 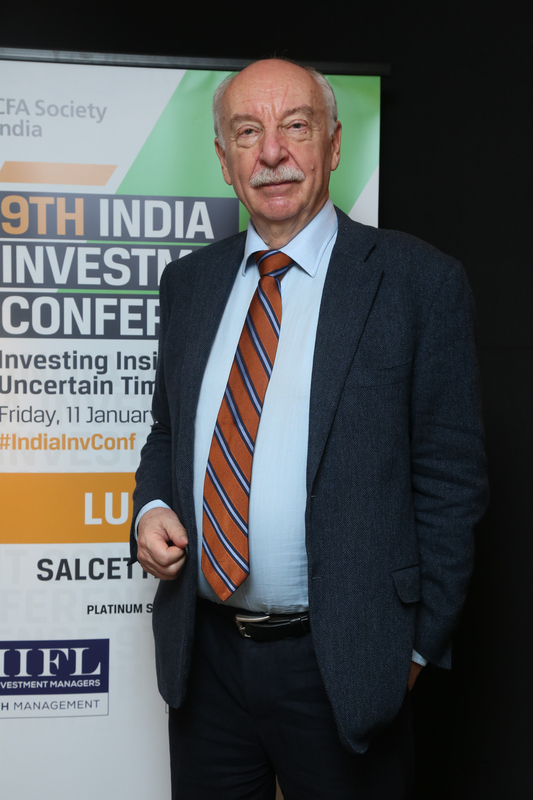 At the second Value Investing Pioneers Summit, Mr Thomas (Tom) Russo gave a talk on ‘Lessons from Global Value Equity Investing’. Given below is a summary of the talk. Tom Russo believes one can earn added alpha by deferring taxation, as any taxes not paid and deferred compound and add to overall returns. For deferring taxation, we need to invest in Long Term Ideas where we can minimize churn and hold for substantial period of time. Tom Russo is a big advocate of Investing in Multi National Corporation (MNCs) as because of their global nature, these companies have more opportunities to reinvest their free cash flows . He himself holds a lot of MNC’s in his portfolio. This reduces the need to churn the portfolio and look for new opportunities as he can keep holding on to the same businesses as they grow by investing their cash flows in markets which offer growth opportunities. Capacity to reinvest free cash flows in various opportunities and countries. Very rare companies exist that can reinvest right amount of cash flows. Globally Adept Management, which are multilingual and multicultural: He mentioned that just like an Indian does not know names of any good Baseball Player, similarly Americans don’t know names of any Cricket Player. Very few people in the world speak more than 3 languages and yet there are some remarkable MNC’s that transcend borders and cultures and are able to operate in many countries. There are rare companies that reinvest the ‘right’ amount. Most managements usually underinvest as they are worried about the impact on their earnings in short term and the resultant effect on stock prices and the value of their stock options. Capacity to Suffer: He further emphasized that he prefers to invest in Family Controlled companies. Family Controlled companies can say no to what wall street demands of them. They can thrash short term in pursuit of long term, give a long rope and lend support to management for the long term, thereby aligning interests and minimizing agency costs. Family controlled businesses normally have better vision. Whereas rest of the market sells only 100 million barrels of bottled, branded and refrigerated beer. These businesses have a huge growth opportunity as there is a large unserved market. This offers price growth and price inelastic growth. Tom also gave examples of companies who lacked the “capacity to suffer” or took short term decisions to please wall street and destroyed shareholder value. At the end, Tom talked about how as a portfolio manager or investor who is looking to outperform over long term, should also have the capacity to suffer in the short term for long term benefit of the portfolio and investors. As an example, he explained how the portfolio of his partnership – Semper Vic Partners – depreciated by 2% in year 1999, when the DJIA was up by 27% due to the rally in tech stocks. Due to the capacity to suffer that one bad year, the portfolio outperformed substantially for next five years. What they don’t teach you anywhere? The underlying theme or message of his talk was that – there are no rules and everything must be doubted and challenged. Samir went on to dispel some of the common beliefs/assertions that most value investors have. He said that as there are no rules, these should also be challenged. We (should) buy stocks where we have high conviction. Conviction on rejected stocks is more as we know with more clarity what is bad than what is good. What we buy, we track/watch closely. if the conviction was high, one would tend not to do that. Research focus should be on eliminating bad, not in choosing what is good. Most investors take this statement of Warren Buffett as gospel truth without fully understanding what he actually said. “When we own a portfolio of outstanding business with outstanding managements, our favorite holding period is forever.” – is what Buffett said in Berkshire letter to shareholders 1988. The conditions of ‘outstanding business’ and ‘outstanding managements’ have to be met for stocks to qualify as ‘forever’ bets. While Buffett’s favorite holding period is forever, it is not the only option but favorite amongst many. We (should) own stocks for the long term. Our biggest advantage as an investor is we can walk away anytime unlike a promoter, so why should we hold stocks for long term? As an investor, we need to revisit our thesis on a regular basis and hold only if company continues to deliver. Example: We are holding HDFC bank for more than 20 years but yet don’t call it long term stock because the day anything goes wrong we can move out. Approximately 20% of stocks held for more than two years. When will you know the management is good? How will you separate the Halo effect? You will know good management only if stock price increases. Perception of management changes based on the stock performance. Before stock price increase ; nobody knows is it a good management or not. Diversification is a protection against ignorance, it makes little sense for those who know what they are doing. If concentrated funds do better, what if you buy 3 such funds? Do you still do better? Overall we own 40-50 stocks of three concentrated funds but our portfolio is diversified. Before investing in an idea based on some facts and analysis, ask “who doesn’t know that”? While investors know a lot of information, not everybody acts in the same way. Example: In case of HDFC Bank everyone knows everything about the company. As an investor we need to focus on big picture & size of opportunity as tiny incremental information may not add any value. If that is the case then only a single person can make money in any stock. It is not necessary to know more than everyone else. What is important is how we act and behave basis whatever information we have. If good people would not buy, then bad people will buy and make money to become stronger (pun intended). So what should they teach you? These books show that over long period equity beat all the asset classes. Have a diversified portfolio. Reject Concentration. Try to get more knowledge, not more information. Money Saved is better than money earned. How one performs during negative months matter a lot to the performance. Example: Nestle, HUL etc. Bottom-up strategy works best in sectors/themes with strong tailwinds. Look first for reasons to reject, not for the reasons to buy. Rejection has far more conviction than buying. Investing isn’t complicated – buy businesses quoting less than they are worth. How do you know the worth? Well, that’s really complicated..! What we have learned from history is that people don’t learn from history. And that is the reason why a majority of investors do not earn good returns from their investments over the long term. Those who make superb returns on their investments are good students of market history and have learned the lessons quite well and stick to it. There is no denying that equity markets go through a cycle. Broadly we can call it a cycle of Greed & Fear. These cycles have happened many times in the past and will continue to happen in the future. Stock markets are a reflection of collective human emotions. Like we experience phases of joy and sorrow in our lives, similarly, equity markets also experience emotional upheavals due to collective actions based on perceptions of human beings. In a course towards market peaks in the last 20 years, following are the Sensex returns whenever it has crossed 25x PE multiple. Sensex crossed 25x PE three times in the last 20 years and the average CAGR over the next 5 years period is paltry 2.54%. On the contrary whenever Sensex PE fell below 14x multiple, the point to point returns in subsequent years have been terrific. Equity markets generally go through intermittent (small) corrections and big secular corrections. The intermittent corrections are up to 20% which occurs while the markets go through a longer trajectory from trough to peak. From the peak a major secular correction of 50-60% occurs once in a decade. These corrections happened multiple times in the past and will continue to happen in future. The timing and the extent of such corrections is difficult to ascertain but there are telltale signs during the extremes of the market. Retail participation is huge. People with very less knowledge about stocks and most risk-averse FD investors start putting money in equity markets. However, those consumed by greed always have reasons to ignore on the premise that “this time it’s different”. Unfortunately, these words prove to be the most dangerous words in investments every time. Retail participation dips significantly. Rather, they start taking out money fearing a further fall. Again, the investors consumed by fear believe that the world is going to end and this time it’s different than the previous bottoms. In hindsight, everyone saw the financial crisis coming in 2007. In reality, it was only a fringe view. The next correction will be the same (they all work like that). However, the reasons are different every time. Do not get mislead by the term – this time it’s different. Never forget that “mean reversion” happens over medium to long term. Do not buy something which is priced much higher than it’s worth. Finding true worth of any business/asset class is not an easy exercise. You can invest in the best business and still lose your money.. Price you pay versus the value you get makes a lot of difference in investment returns. Markets can continue to remain irrational (expensive or cheap) for a very long time. Be patient. Expensive doesn’t mean that market will fall tomorrow and cheap doesn’t mean that market will start moving up tomorrow. Never predict or try to time the market on day to day basis. But this doesn’t mean that you buy at any price. The price, compared to the intrinsic value, at which one buys, determines the potential risk and returns. Caution yourself against the herd mentality. Investing in popular themes/assets etc. won’t generate good long-term returns. Do not get mislead by past returns. Selling is important too. Market peaks provide a good opportunity to reduce allocation to ridiculously expensive assets. If you avoid loses during a market downfall, you can make significant returns in a market upswing, provided you have courage to buy when everyone else has given up hope. Based on the lessons learned, one should develop an investment philosophy which guides you during different market scenarios. If you do not have an investment philosophy in place, you end up buying at the top and selling at the bottom like all other people. The most significant tenet of investment philosophy followed by many successful investors is “margin of safety”. Many wised-up investors understand that they cannot predict the future. So, the best one can do is to invest at prices lower than what something is conservatively worth, thus providing a margin of safety. Lower the price from the worth of an asset, higher is the margin of safety (lower downside) and greater are the potential future returns.